According to the Polish Central Statistical Office, chemicals production grew 4.6% in 2017, with rubber and plastics production even increasing 9.5%. In 2018 further production growth is expected, although at a slower pace, supported by GDP expansion forecast of more than 4%. Many players have strong market positions, domestically as well as in Central and Eastern Europe. This enables them to focus on innovations (more than 20% of the existing patents in Poland stem from the chemicals sector) or to expand into new market segments with mergers and acquisitions. 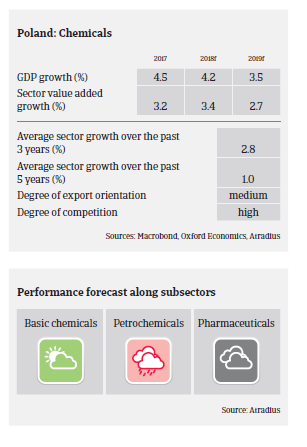 Chemicals businesses’ profit margins are expected to remain stable in 2018. Gearing in the Polish chemicals sector is average, and many companies use investment credits in order to finance their investment projects for innovations. Polish banks are generally willing to provide loans to the industry. The Polish benchmark interest rate has remained low at 1.5% since March 2015, and the subsequent low interest rates for credit has spurred chemicals businesses to use bank loans to finance their investments. On average, payments in the Polish chemicals sector take 30 to 60 days, but can take 180 to 240 days for seasonal products (e.g. fertilizers). Payment behaviour has been good over the past two years, and the number of non-payments and insolvencies has been low. Given the solid performance of the chemicals sector, no major increase in business failures is expected in 2018. However, in early 2018 we noticed several payment delays in the fertilizer distributors segment. Our underwriting stance remains generally open for the chemicals sector. However, we are restrictive on fuel wholesalers and smaller fuel station chains in the petrochemicals subsector due to a grey economy in fuel trade in the past, which has led to increased VAT and excise tax controls. Our underwriting stance for the pharmaceuticals segment is neutral, with a more cautious approach concerning drug wholesalers, as the government heavily regulates the market. New regulations on the concentration of pharmacies (e.g. restrictions on pharmacy ownership) and drug distribution could influence performance and results of all market players.